Workout routines are what exercises, how many sets, how many reps etc. that you do for each muscle. 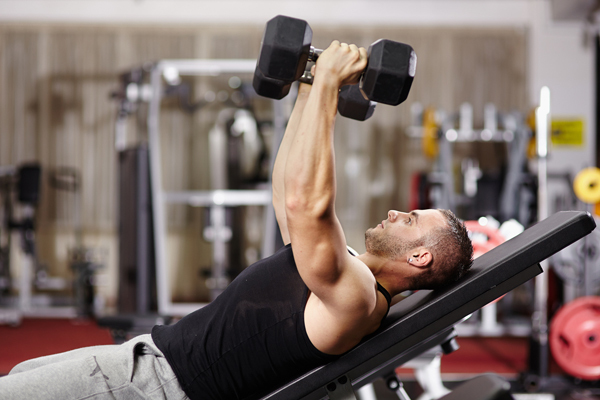 For example, 3 sets of the flat bench press, 3 sets on the incline bench press, and 2 sets of flat bench dumbell flyes is an example of one of the many chest weightlifting workout routines. A workout split is a term given to how you split up your workout. What days you do what muscle on. For example, doing biceps back and legs on Monday, and doing triceps shoulders and chest on Thursday is a workout split. Here i will give you some sample workout routines, the routine I use, and tell you how to make your own workout routine. Work chest, triceps and shoulders on the same day, and biceps and back on the same day so that it's ok if the secondary muscles get worked that day, because your doing them anyway. Separate those muscles that work a secondary muscle so that they are far enough apart not to overtrain you. For example, do Chest Monday, triceps on Wednesdays, and shoulders Friday... and biceps Monday with chest, and back Wednesday or Friday. This is personally what I prefer, and do myself. Do chest and triceps Monday, and shoulders Thursday, and back and biceps together on Friday. Coming up with weightlifting workout routines and splits and programs isn't really rocket science, once you understand the basics you can create your own. But, here are a few sample split routines and programs off the top of my head I have either used at one time, or are commonly used by other people. Remember, these are just sample programs. Some people like to workout on the weekends, and I don't. So in all the samples I made them off days. It all depends on what days you have time to workout and/or when you want to workout which is why these are just samples, not splits you have to use.